A huge thanks to Dennis Kriesel of the Eclectic Gamers Podcast for this interesting article on The Details of SPIKE! Check out the Eclectic Gamers Podcast here, and their Facebook page here! Since the dawn of the solid-state era, board sets and their capabilities have driven the features, gizmos, and light shows pinball players experience when they step up to a game. One of the newest, and least understood, of these board sets is Stern Pinball’s SPIKE system. Since hitting the coin-op scene in 2015 with WrestleMania, SPIKE represents the most significant change in solid-state technology Stern has ever undertaken. With it comes a lot of confusion on the consumer and operator side. This article will attempt to shed a wee bit of light on the system, explain why the change occurred, the basics of how it works, and the distinction between SPIKE 1 (sometimes referred to simply as SPIKE) and SPIKE 2. Stern Pinball only had one major board set change in its history prior to SPIKE. The S.A.M. system debuted in 2006 with World Poker Tour, but in terms of functionality it was very similar to Whitestar (the board set SEGA started and Stern Pinball continued to take advantage of). As community repair documentation indicates, the layout and different boards used by S.A.M. were basically just miniature Whitestar boards. The main difference many pinball owners noticed and appreciated was the ability to update software revisions via a USB port rather than necessitating an EPROM programmer. That’s not to say S.A.M. was devoid of computing enhancements. S.A.M. took advantage of an Atmel AT91R40008 microprocessor, a 16-bit system that clocked at 40MHz with 512K of RAM. These numbers are modest compared to personal computers of the era, but represented a significant upgrade over Whitestar, which relied on a Motorola 68B09E microprocessor, an 8-bit system that clocked at 2MHz and only had 8K of RAM. So, as the years passed, S.A.M. began to show its age, and Stern began looking to future-proof with the next board set. Before SPIKE launched in 2015 on the coin-op side, it was used in two home-model pinball machines: Transformers The Pin (in 2012) and Avengers The Pin (in 2013). This is, in part, because SPIKE was designed to accommodate a market where homeowners, rather than operators, acquire a significant quantity of pinball machines. Be modern: Have enhanced processing capabilities versus S.A.M. Another advantage, from Stern’s perspective, is ease of repair (in addition to improved reliability to avoid repairs more often). This is because the modular system relies on a series of node boards. Rather than a homeowner being expected to know how to solder and replace through-hole board components, the system would allow the node board itself to easily be replaced. The challenge from owners’ perspectives to this approach is one of cost. The node boards are, in theory, to be low-cost, but that concept is relative. A common complaint about the node board model from those familiar with traditional pinball repair is the boards themselves are not easily repairable by a layman (node boards rely extensively on surface-mounted components, which require specialty equipment for repair that many operators and pinball technicians lack). As such, node board replacement is the only viable repair option for many broken games, but some feel the costs of those boards remain too high at present for that to serve as an attractive option. It remains to be seen if, as the SPIKE system’s use continues to expand, those replacement costs will be driven down by economies of scale. In short, it can do a lot. SPIKE relies on a bus systemfor communication, and since node boards just plug into the system the option to scale in new features is theoretically quite easy. 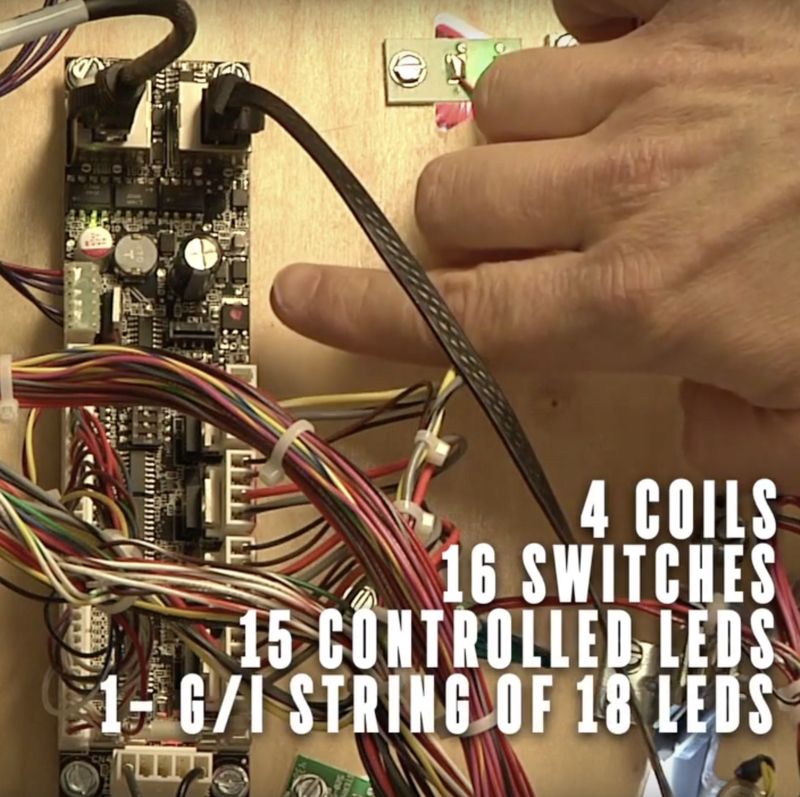 Most traditional solid-state pinball systems relied on a lot of wires and used a matrix approach to activating features like coils or controlled lamps. Unlike prior board sets, which faced overall limitations on the number of controllable lamps or drivers (due to matrix size limitations), SPIKE allows for the burden to be distributed to the nodes themselves, bypassing the historic limitations of an MPU/CPU board. That said, limitations on any system will always be present, and that was something SPIKE faced relatively early on, when the switch from the DMD to an LCD display occurred. SPIKE 1 and SPIKE 2 hold one primary commonality: the sound system. Otherwise, the shift to SPIKE 2 witnessed a series of upgrades, mostly around driving the new display system. SD card storage was modified (SPIKE 2 can be 8GB or 16GB, whereas the SPIKE 1 relied on either 4GB or 8GB), as video assets can take up a significant amount of storage space. In terms of the microprocessors, while there are various differences between the SPIKE 1 and SPIKE 2 chips (such as clock speed), the main takeaway to note is the NXP Semiconductors’ microprocessor includes a GPU (Graphics Processing Unit) with an H.264 video decoder. H.264 is a very popular video compression standard and used in a lot of video content delivery. This is the big change to allow the use of the new LCD display system, along with the massive jump in RAM SPIKE 2 has (1GB versus just 64MB on SPIKE 1). The visible change to the end users between the system is on the display side. SPIKE 1 games use an LED-based DMD in the traditional 128×32 resolution. For SPIKE 2, the main display has a resolution of 1360×768 and is an LVDS (Low-Voltage Differential Signaling) LCD. This style of display consumes a very low voltage, but also has the benefit of generating very little electromagnetic noise and has little susceptibility to electromagnetic noise interference. SPIKE 2 also has an HDMI (High-Definition Multimedia Interface) that can accommodate another display (resolution of this display can vary). Stern Pinball’s SPIKE system marks a dramatic departure for the company in terms of how its games’ features are driven. The change is reflected in the concern held by the community on repair capabilities and the cost to replace node boards. Nonetheless, the system itself is a major advancement from where S.A.M. was in terms of raw capability (and, in Stern’s assessment, reliability and efficiency), thanks to the bus system connecting a series of node boards. While the system was designed for scalability, the decision to move towards LCD video displays resulted in the rapid development of the SPIKE 2 system, with a stronger microprocessor that supported video decompression, more RAM to take advantage of, and most notably an entirely new display format for the company. Assuming no additional system-straining changes occur in the near-future, it is reasonable to assume the SPIKE 2 system will endure for a significant period of time. The author extends his thanks to Zach Sharpe, of Stern Pinball, for all his assistance in obtaining the technical details of the SPIKE 1 and SPIKE 2 board sets, the list of common node boards and their capabilities, and the CPU chip specifics for S.A.M. and Whitestar. Previous Previous post: Happy Halloween Pinheads – Custom Bram Stoker’s Dracula in a coffin!